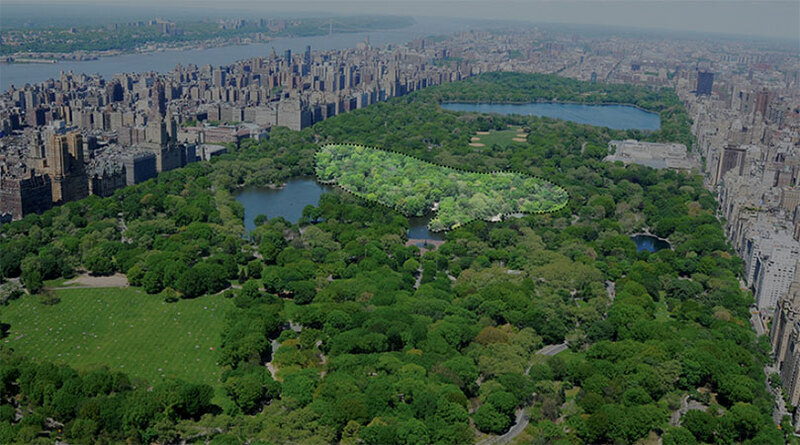 At the very center of Manhattan Island, near the middle of Central Park, is a place with almost no signs of the City. Instead of the relentless street grid is an intricate network of paths that winds through a densely wooded landscape. The trees block any views of the surrounding skyline, and the sounds of birds and a stream coursing down a hill mask the distant sounds of sirens and jackhammers. 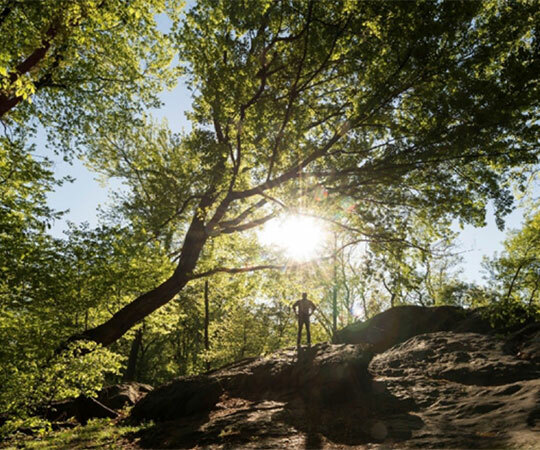 This is the Ramble, the landscape that most embodies Central Park’s enduring purpose as an urban oasis and an immersive experience of nature. Located between approximately 73rd and 79th Streets, and more than one avenue block wide, the Ramble is only 36 acres — but its irregular layout creates the illusion that it is much larger (and makes it quite easy to get lost). The Ramble is part of what Central Park designers Frederick Law Olmsted and Calvert Vaux called “the heart of the Park.” This area, which is south of the Great Lawn and north of Sheep Meadow, also includes Bethesda Terrace and the Lake. 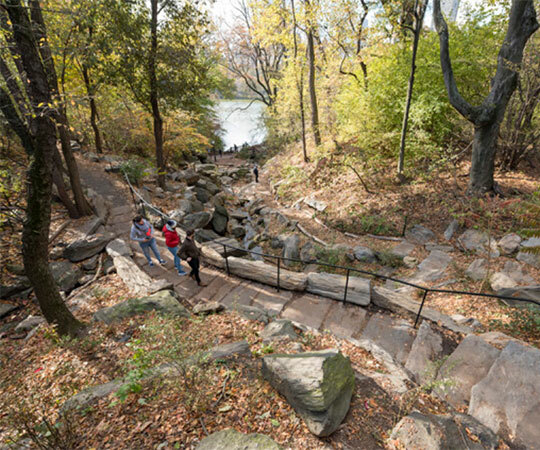 The Conservancy recently completed a restoration of the Ramble that highlights the primary goal of all our work — to preserve and enhance the Park’s role as an urban oasis. This project drew its inspiration from the original design and intent for the Ramble, connecting this history to the present and showing how the Park is still so important and relevant to contemporary urban dwellers. One of the earliest guides to Central Park, written by Clarence Cook and published in 1869, described the Ramble as “the greatest attraction the Park contains.” The Ramble, one of the first sections of the Park to be opened to the public, was one of its most astonishing wonders — a completely engineered landscape that appeared as if it was a natural wilderness. 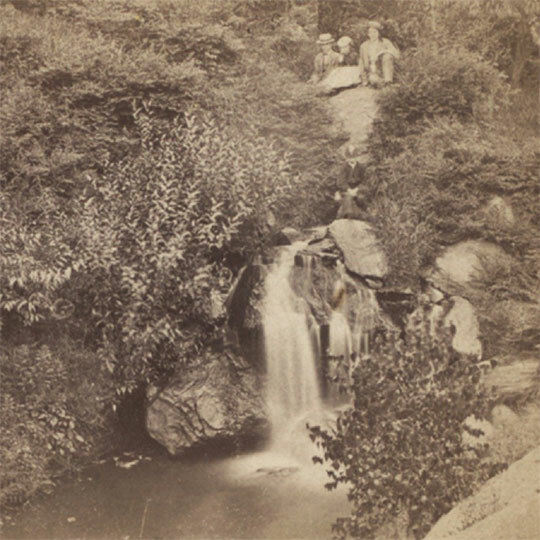 This was intentional: the Park’s designers, Frederick Law Olmsted and Calvert Vaux, aimed to recreate the experience of landscapes such as the Catskills or Adirondacks, and to provide an even deeper escape into the country in what they knew would someday become the heart of the City. Olmsted and Vaux intended the Ramble as a rural retreat for all urban dwellers — and particularly for those who could not afford to escape the City. Source: New York Public Library, The Miriam and Ira D. Wallach Division of Art, Prints and Photographs. 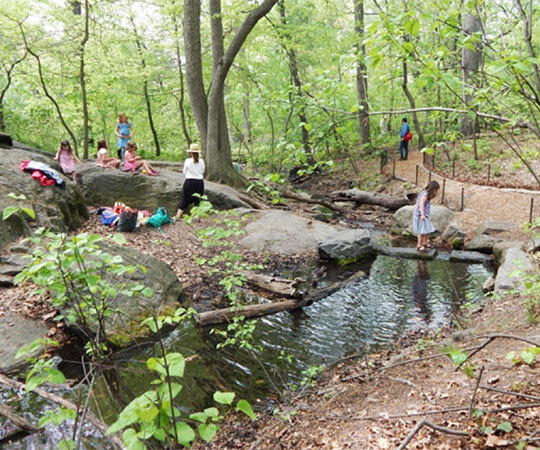 This spring, the Conservancy completed a five-year, multi-phase project in the Ramble to renew its landscape, upgrade infrastructure, and rebuild historic features. While ensuring the long-term ecological health of the landscape was a priority, the primary goal of the restoration was to improve access to the unique experience of nature — and escape from the urban environment — that the landscape offers. In keeping with the original vision for the Ramble, this meant creating more opportunities to climb rocks, to sit alongside streams, to see native wildflowers, and to watch birds. The Conservancy recently completed a five-year restoration of the Ramble, creating more ways to interact with the impressive rock formations found throughout the landscape. The Conservancy’s landscape architects focused on paths, which are the primary vehicle for experiencing the Ramble and whose labyrinthine layout is a striking aspect of the area’s design. In addition to rebuilding existing paths, many of which had deteriorated, the Conservancy restored some historic paths that had been removed over time. Some of the newly restored paths are called trails because they are paved with wood chips and similar surfacing. They take visitors deeper into the landscape: to the edge of streams and to vista points. Many direct visitors to some of the Ramble’s impressive rock outcrops. Some of these trails create shortcuts, while others end in quiet nooks. The Ramble’s winding paths and trails can lead to streams, vista points, outcrops, quiet nooks, and more. On most of the Ramble’s trails or paths, it’s hard to tell where exactly you are going and what you will stumble upon. All the paths are winding, and you cannot see any buildings or other landmarks for orientation. In restoring these paths, the Conservancy connected to the original intent for the Ramble, which, in Olmsted’s words, was to “affect the imagination with a sense of mystery.” Wandering along these paths and trails today is a continuous experience of wonder and surprise. As part of our recent work in the Ramble, new paths and overlooks provide access to the Gill cascade. These descriptions, separated by 150 years, illustrate what makes Central Park remarkable and why its history and preservation are important. While the Park has certainly changed, the continuity of experience in the Ramble is one example of how much its purpose and value have endured. Learn more about the history of this landscape — and see firsthand how its restoration has enhanced its charming characteristics — by taking our Ramble Tour. Visiting with kids? Families can also explore this landscape and discover its diverse wildlife on a Discovery Walk for Families: Woodland Wonderland in the Ramble. You can also download our free Discovery Journal for the Ramble. If you want to explore this landscape from home, watch our recent Facebook Live video showcasing its restoration. Marie Warsh is the Conservancy’s Historian.